Mercedes-Benz has long built practical and approachable hatchbacks for Europeans and now they’re finally building one for us. What do you need to know before you buy a Mercedes GLA? Don’t worry, we’ll tell you everything right here in the Ultimate Buyer’s Guide. With the exception of the short-lived C-Class hatchback, the only way to get a hatch in the back of your Mercedes in the United States was to either buy a wagon or an SUV, despite the fact that the company has sold various small five-door hatches around the globe for decades. The GLA has rectified this short-sightedness with a compact “SUV” built on the same platform as the Mercedes CLA. Mechanically and visually similar to the European A-Class, the GLA has been Americanized with a slightly more rugged appearance to imply that you could actually take it off road if you really wanted to. Basically, Mercedes has built a very nice Subaru. The regular GLA250 spec car handles much like its CLA sibling in that it offers most of the comfort you’d expect from a Mercedes, blended with something like the handling you’d also hope to get. It’s not a precision corner carver like the AMG-GT, nor is it a cushy saddle for plutocrats like the S-Class. Instead, the GLA is exactly what you should be happy with from a mid-$30k Mercedes, capable of driving just fine so long as you don’t push it too hard. Whatever pretense Mercedes might have in calling it an “SUV,” the car doesn’t perform like an SUV. The little turbocharged four-banger puts out a little over 200 HP and, mated to a seven-Speed dual-clutch transmission, does a reasonable job of accelerating the car. It’s not fast, but you won’t think it’s slow until you drive it back-to-back with the GLA45 AMG. Why does the GLA45 AMG exist? Who really wants a $50,000 Mercedes hot hatch? The GLA45 is so utterly pointless that it seems entirely necessary after driving it. Its highly tuned turbocharged engine manages to squeeze nearly double the power out of 2.0 liters at 375 horsepower. That’s enough to propel this little car to 60 mph in 4.3 seconds. With power suddenly rushing through all four wheels it sometimes feels more like a little rally car than a buttoned up wagon for weekend antiquing. While the seven-speed dual-clutch transmission is good enough for the less powerful GLA250, it does sell the GLA45 a little short, meaning you’ve got to foresee when you’re going to want the power and get on it early if you have any hopes of rocketing out of turns. The Mercedes GLA made its first appearance as a concept car at the 2013 Shanghai auto. Shortly thereafter, the production version bowed at the 2013 Frankfurt Auto Show. Shortly after that, the AMG GL45 showed itself to the world at the 2014 North American International Auto Show. The CLA-based wagon-y CUV aimed to compete with the BMW X1 and Audi Q3 by bringing a new generation of the 4MATIC all-wheel drive system, a small 2.0-liter turbo engine, a seven-speed dual-clutch transmission, lots of interior luxury and the promise of excellent fuel economy. In 2016, Mercedes updated the infotainment system with a new head unit that includes a seven-inch display versus the previous model’s 5.8-incher. In addition, 2016 saw new standard equipment such as dual-zone climate control, keyless ignition, Dynamic Select drive modes and seat cushion length adjustment. In addition, the AMG GLA45 received a 20 horsepower and 18 lb-ft bump, resulting in 375 horsepower and 350 lb-ft. The AMG also received revised gear ratios and an available Dynamic Plus Package, which includes a limited slip front differential, AMG Adaptive Suspension and “Race mode.” This results in a new 0-60 time of 4.3 seconds versus last year’s 4.8 ticks. They say variety is the spice of life. In the old days, automakers would offer that sweet coriander to shoppers by giving them a choice of engine sizes. If you were looking for something cheap, you’d grab the four cylinder, but if you wanted a bit more grunt, you might opt for the V6. But times have changed, and now carmakers provide customers with life’s most beautiful spice–variety in engine power output–using the exact same base engine. In this case, if you’re a fan of two-liter turbocharged inline fours, boy do we have great news for you! The Mercedes GLA comes exclusively with exactly that type of engine! The base GLA250 makes 208 horsepower and 258 lb-ft of torque, while the AMG GLA45 makes a whopping 375 ponies and 350 lb-ft of torque. Both are mated to a seven-speed dual-clutch automatic. The front-wheel drive GLA250 will accelerate to 60 MPH in 7.2 seconds; the all-wheel drive version will get there one tick quicker. But the AMG GLA45 steals the show, scorching to 60 MPH in only 4.3 seconds and topping out at 167 MPH. Why a mini CUV needs to be that ridiculously fast is beyond us, but hey: More power equals more better. The Mercedes GLA only weighs a modest 3,300 pounds, and with a small turbo four cylinder and a seven-speed transmission, you’d expect it to get good fuel economy. What you might not expect, though, is for the GLA to be at the top of its class, besting cars with significantly less power. The Mazda CX-5 is the benchmark for small gasoline SUVs in the fuel economy department; it scores 35 MPG on the highway and 29 combined. It does so with a 2.0-liter naturally aspirated inline-four that makes a paltry 155 horsepower. So when the 55-horsepower-richer Mercedes GLA scores the same gas mileage as that fuel-sipping CX-5, we can’t help but be impressed. Of course, the Mercedes is more expensive than the Mazda, but that doesn’t mean it isn’t remarkable that the German GLA is at the top of the small CUV fuel economy totem pole. 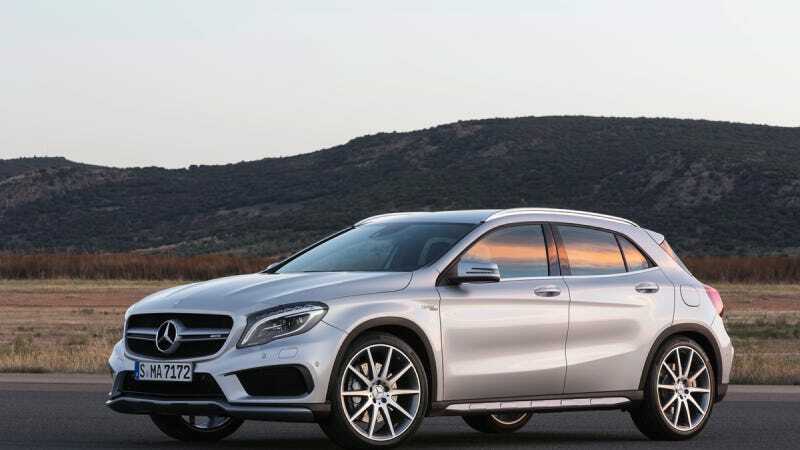 The Mercedes GLA comes as either the GLA250 or the AMG GLA45. The former spins either the front or all four wheels, while the latter opts for all-wheel drive only to put down that 375 horsepower. Steering for all GLAs is electric and suspension is a MacPherson Strut design up front and a multilink setup in the back. Brakes on the GLA250 are 12.6 inch discs in the front and 11.6-inchers in the rear. The performance-oriented AMG GLA45 gets bigger 13.8-inch pies in the front and 13-inch rotors out back. GLA250: Starts at $32,500. Notable standard features: 2.0-liter turbo I4, seven-speed dual-clutch automatic transmission with paddle shifters and multiple drive modes, front-wheel drive, 18-inch alloy wheels, 4.5-inch cluster display, 10 airbags, Attention Assist, front foglamps, Collision Prevention Assist Plus, dual-zone climate control, power liftgate, 14-way power driver seat with memory, brake hill holding feature, seven-inch color display for infotainment system, Bluetooth integration, MB-Tex fake leather seats. Notable options: Sport Package: unique body styling, 19-inch AMG wheels, perforated front brakes with painted calipers ($2,300); Interior Package: Leather upholstery, MB-Tex fake leather upper dash trim, multicolor ambient lighting, sport front seats ($1,700+Premium Package); Multimedia Package: rearview camera, eight-inch display, navigation, SD card reader, Nav and satellite radio subscription ($2,480); Night Package: black exterior accents, black AMG wheels, Sport package ($2,600); Driver Assist package: DISTRONIC PLUS adaptive cruise control, Blind Spot Assist, Lane Keeping Assist ($2,500); Premium Package: heated front seats, KEYLESS-GO proximity keyless entry, Harman Kardon sound system, Auto-dimming driver-side and inside mirrors, integrated compass, garage door opener ($2,400); Panorama roof ($1,480); Bi-Xenon headlamps and LED taillamps ($850); Heated front seats ($580); 14-way power front passenger seat with memory ($400); Harmon Kardon sound system ($850). GLA250 4MATIC: Starts at $34,500. Notable standard features over GLA250: all-wheel drive, off-road package with Downhill Speed Regulation. Similar options as GLA250. AMG GLA45: Starts at $49,580. Notable standard features over GLA250: Much more powerful 2.0-liter turbo I4, seven-speed AMG SPEEDSHIFT dual-clutch automatic transmission with paddle shifters and multiple drive modes, all-wheel drive, bigger performance brakes, AMG Sport Suspension, AMG Sport Exhaust, unique body styling, unique AMG grille, 19-inch AMG wheels, bi-xenon headlamps and LED taillamps, rain sensing wipers, 12-way power MB-Tex front sport seats with memory. Notable options: AMG DYNAMIC PLUS Package: AMG Adaptive Suspension, AMG Limited Slip Front Differential, RACE mode, Race Start function, raised top speed ($2,800); Interior Package ($1,500+Premium Package); AMG Performance front seats ($2,250+Interior Package); AMG performance steering wheel ($600); AMG Night Package: black chrome tailpipes, black air-dam splitter, black side mirrors, black side-window trim, black roof rails, black side sill inserts, black rear diffuser ($750); Aerodynamics Package: front splitter, flics in front apron, large rear wing, ($1,950+AMG Night Package); Exterior Carbon Fiber Package: carbon fiber mirror housings, front splitter, rear apron trim and side sill inserts ($3,700); otherwise options similar to GLA250. If we wanted a comfortable, practical, fuel efficient Benz and we lived somewhere that didn’t see much snow, we’d just grab a GLA250 and add leather. To do that, we’d have to drop $1,700 on the interior package and another $2,400 on the Premium Package (which adds heated front seats and a fancy sound system). After destination fee, we’d be paying $37,525 for our plush little front-wheel drive hatchback. That’s still lower than the starting price of all other Benzes (sans the CLA upon which the GLA is based). Not bad. But we’re enthusiasts, and front-wheel drive, moderately-powered crossovers don’t get our blood rushing. So where our heart really lies is with the AMG GLA45. It’s a fancy, insanely fast all-wheel drive hatchback–basically a grown-up Subaru WRX, and what’s not to like about that? If we were spec-ing out a GLA45, we’d want limited slip diff, adaptive suspension and launch control, so we’d grab the $2,800 AMG DYNAMIC PLUS Package. We like the looks of the Aero Package and those bolstered AMG Sports seats will keep us from bouncing around in our little Mercedes rally hatch. Unfortunately, the Aero Package requires the Night Package, so that would cost us $2,700 and the seats require the Interior Package and Premium Package, so those would cost us $6,150. In the end, we’d be dropping $62,155 on a small, pointlessly powerful, absolutely insane crossover that makes no sense in this world. But you know what? We here at Jalopnik are into that.